Cardinal Health created a unique surgical glove line called Esteem® which attempts to combat contact dermatitis for the surgeon while the gloves are worn. First, Esteem® surgical gloves are made from the polyisoprene material. Polyisoprene has gained high attraction as the ideal synthetic material to use since the physical properties are very close to natural rubber latex. Polyisoprene is 100% latex-free and provides high tactile sensitivity to ensure surgeons are able to operate under ideal conditions. 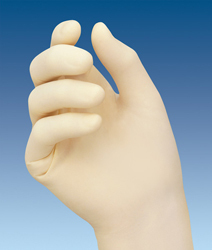 Secondly, the Esteem® surgical glove has an inner coating using the unique Neu-Thera® coating formulation. The Neuthera® coating formulation consists of key vitamins, lotions, and nutrients that are known to hydrate and protect the hands from moisture loss. Cardinal Health recommends clinicians who have dry irritated hands to use the Esteem® glove to help improve their skin condition.